Mike Pence's religion: Why the Trump VP pick is quiet about his beliefs. Where Is Mike Pence’s Faith? He was an outspoken evangelical. Now Trump’s VP pick hides his beliefs under a bushel. Mike Pence used to decline to dine solo with women who weren’t his wife. Now he’s Donald Trump’s pick for VP. These days, Pence talks about Reagan a bit differently. 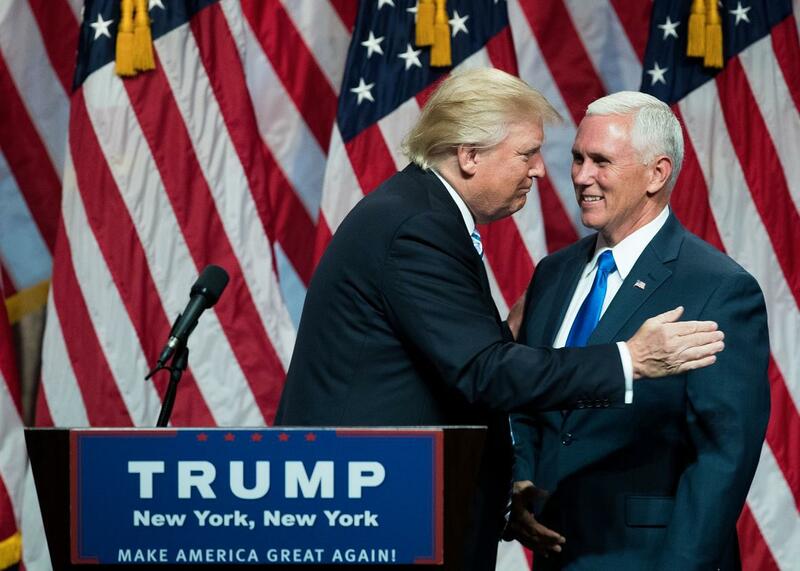 During his recent (and successful) audition to be the running mate of a television star, Pence paid Donald Trump the highest sort of Republican praise. “I think he is someone who has connected with everyday Americans like no one since Ronald Reagan,” Pence told reporters. That Gipper pivot says a lot about how Pence has shifted over the years, as he’s moved from the media to Congress to the Indiana statehouse—how he’s become less candid, less human, and more shamelessly fixated on stoking his career. Pence’s religious beliefs still shape his politics as surely as they did when he voted for Carter. But as part of this transformation, he has alloyed his faith with political expediency, keeping his evangelicalism at the center of his worldview, even as he’s become ever less willing to discuss it. Pence has a strange conversion narrative. He grew up in a big Irish Catholic family of Democrats in central Indiana, serving as an altar boy, attending parochial schools, and idolizing another liberal president: JFK. But in 1978, while a freshman at Indiana’s Hanover College, he converted to evangelical Christianity through the influence of a nondenominational fellowship group. “I simply made a personal decision for Christ,” Pence told me in 2012, when I was working on a profile of him after he’d won the gubernatorial race. You don’t see many of those, even in Indiana, but Pence’s beliefs had not yet defined his politics. He’d gone through a second conversion in college, this one ideological. But the two conversions didn’t always inform each other. After all, Pence voted for Carter because of his faith, but he still voted Democratic. Even when Pence ran for Congress in 1988 and 1990, in the twilight of the Reagan era, he didn’t link his politics and his faith. Both campaigns focused more on his opponent’s lucrative reliance on PACs than on anything remotely religious. It was all pretty stunning to see. The man who once quoted Genesis 12:3 to justify his foreign policy was now speaking in phrases so platitudinous they felt ripped from the chorus of a particularly bad Christian rock song. But this was all by design. While reporting that profile, I learned of a private meeting Pence had held in the fall of 2010. With his closest aides, he’d plotted out how to run for governor—and how to downplay a record in Congress that included trying to defund Planned Parenthood and trying to block the repeal of “Don’t Ask, Don’t Tell,” among other social-conservative stands. Instead of highlighting those stands, as at least one adviser had urged him to do, Pence decided to sell himself as a technocratic “jobs and schools” candidate. I asked Pence about that meeting, too. “It was a private meeting,” he replied. Once elected, Pence began pushing a very different agenda. While the most notorious example came when he signed the state’s Religious Freedom Restoration Act in 2015, Pence’s faith has driven decisions big and small. It led him to sign a new anti-abortion law so restrictive that the American Civil Liberties Union is now suing the state. It led him to award a $3.5 million contract to Real Alternatives, a nonprofit that pushes abstinence education and urges pregnant women not to abort. “My faith,” Pence told me in 2012, “has continued to be what I hope is the most important thing in my life.” Pence’s beliefs have shifted at least twice—from his family’s Catholicism to an idiosyncratic evangelical Christianity, and from that to a more hardened and ideological version of the same. If, as he insists, faith does indeed order his life, why did he stop being so open about it? Why strip the evangelizing from his evangelicalism? Good luck getting Pence to comment on that. The easiest answer seems to be that he decided that as his political ambitions grew his public religiosity needed to shrink. There are plenty of politicians who’ve made this same calculation, but few have tried to solve it with Pence’s baggage—or with his bumbling approach. Recall the governor’s infamous appearance on ABC’s This Week in which he tried to defend the RFRA. When George Stephanopoulos asked him if the law licensed discrimination, Pence offered abstract and illogical defenses instead of addressing what most people, whether for or against, saw as the RFRA’s true purpose—an extra defense for Christians who felt under attack by rapidly liberalizing attitudes toward LGBT rights. But Mike Pence, a man with presidential dreams, could no longer say that. And so the polished communicator simply melted down. Even now, as he starts the biggest role of his political life, Pence still doesn’t know how to receive these questions other than by ducking. He’s always been a better idealist than a careerist. That should make for an interesting marriage with Donald Trump.